US, 1992, 82 minutes, Colour. 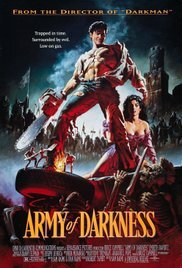 Army of Darkness follows Sam Raimi’s explorations of the demonic, Evil Dead and Evil Dead 2, both from the 1980s. By the time of Army of Darkness, he had already made such serious films as Darkman but was to go on to such notable features as A Simple Plan, For Love of the Game, The Gift as well is three Spiderman films. Other films include Drag Me to Help as well as Oz, The Great and Powerful. This film reintroduces Bruce Campbell as the character, Ash. He is doing some work on a dark book manuscript from the past, the Necronomicon – his pages are seen filling out, blood-red. In his dealings with the book, he is transported back into the Middle Ages. What follows is something of a medievil action romp, confrontation with evil spirits, Ash not wanting to help the people in their struggles simply wanting to get home. The humorous tone is set by having the media evil people speak with rather British accents and vocabulary with Ash strong with his American accent and strong with his American vocabulary and phrases, highlighting the incongruity. When he arrives, there are battles going on, various lords dressed up in armour, angry ladies, including Embeth Davidtz. When people go down a mysterious well, Ash is pushed down himself, fighting diabolical skeletons, escaping the clamping iron gates. Wop what helps him, of course, is his rifle, something which terrifies the locals. After the initial hostility, the leader, Arthur, begins to rely on him. Ash also lets the leader of the opposition, Red, escape. Ash was later to appear in Sam Raimi’s 20-episode television series, Ash vs Evil Dead (2015-2016). This film is high on the list of cult schlock movies.